At the very bottom of every legitimate marketing email, you’ll find the footer section. It’s this part of the message that’s often overlooked by the sender, since most of the focus in the development phase is on crafting compelling content in the body section. But this part of the email, is in fact, a very important component. In addition to making your message CAN SPAM compliant, having a footer resonates with the recipient because it gives them a way to communicate with your brand, manage their subscription or opt out of your list if they choose. Giving these options makes your brand and email program more reputable. Readers have come to expect to find the “fine print” of an email in the footer. Things such as offer details, like product exclusions or deadlines to use a coupon, are often found in the footer. Customer service-related items are also often found here, such as the phone number to call for help and/or an email address to use for problems. Have an easily-located unsubscribe link. Do not bury it in an image. Make sure the verbiage related to the link isn’t misleading. All reputable marketing emails have a means for someone to opt-out of future emails. Include a postal address for CAN-SPAM compliance. Other contact details, like phone number, make it handy for a customer to reach you if the message triggers a need for them to get in touch immediately. A copyright notice to protect your intellectual property from those who might take it as their own. Add a line that explains why they’re receiving the message. “You’re receiving this message because you joined our mailing list when you viewed a recent webinar” can help decrease SPAM complaints if someone has a fuzzy memory about how or why they’re getting email from you. Make it easy for your audience to share your email by including social share links and/or “Forward to a Friend” options. These methods also help keep a recipient on your social media list, even if they unsubscribe from your email list. Here are a couple of examples of good email footers. 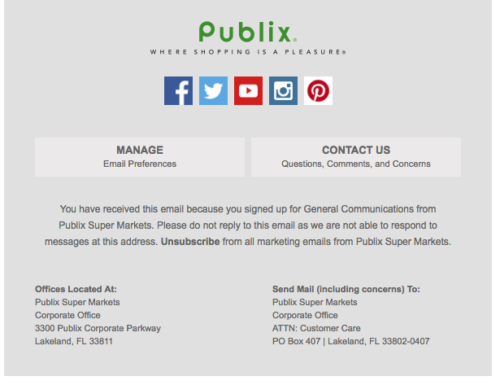 The first is from Publix. It’s clean and isn’t bogged down with a lot of small text. This footer from Scoutmob shows some personality while not obscuring the critical components of the footer.